Obituary – Elliott, William Perry « Perry High School Alumni Association, Inc.
﻿- son of Mr. and Mrs. W. P. Elliott, was born in Perry, Oklahoma, July 2, 1918. He has attended the Perry Schools. While a student in the Perry schools he has been a member of the band, orchestra, Drum Major of Band. He won 1st in Drum Major State Contest 2 years, won a silver medal for oration, and won manual training honor in the 9th grade. He also attended the Tri-State Band Festival and National Band Festival. He is interested in the oil business. ﻿William (Bill) Perry Elliott Jr., 54, former Perry mayor and contractor, died unexpectedly at 8:45 p.m. Tuesday in the hospital at Fairview of an apparent heart attack. Funeral for Elliott will be at 10 a.m. Friday at the First United Methodist church of Perry. Officiating will be Rev. R. C. Veirs, Oklahoma City, former pastor of the city church. Burial will be in Grace Hill cemetery under direction of the Parker funeral home. Elliott, who had been treated for a heart attack a few months ago, had been serving as city manager at Fairview since August 1. He was at work at his city manager’s office in Fairview Tuesday morning when he became ill. He was admitted to Fairview hospital and had seemed to be improving Tuesday afternoon. 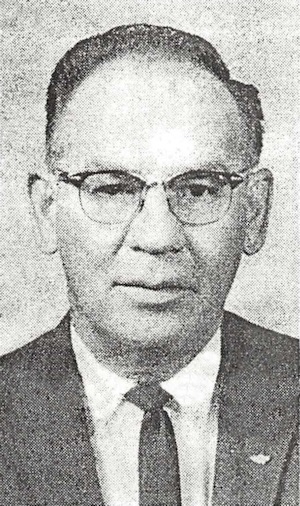 Elliott served as a member of the Perry city council from May, 1959, until the spring of 1963. He was elected for four terms as mayor of Perry. Elliott became mayor of Perry in May, 1963 and served three full two-year terms. He resigned Aug. 31, 1969, early in the fourth term of office. He was born July 2, 1918, in Perry. On Sept. 2, 1935, he was married in Pawnee to Gayle Purdy, who survives. The World War II Navy veteran left Perry in 1969 and moved to Oklahoma City. In 1971 he moved to Wetumka, where he served as city manager. Elliott was a member of the United Methodist church, American Legion and Fairview Lions club. He also was a 32nd degree Mason, a Shriner and a private pilot. Survivors in addition to his wife of the home are two daughters, Mrs. Marvin (Dee Ann) Woodall, Somerset, N.J., and Mrs. Roy (Billie Gayle) Eastin, Freemont, Calif.; two brothers, Forrest, Stillwater and Bob, Oklahoma City; and four grandchildren.